We’re here to help take the stress out of your big office move. 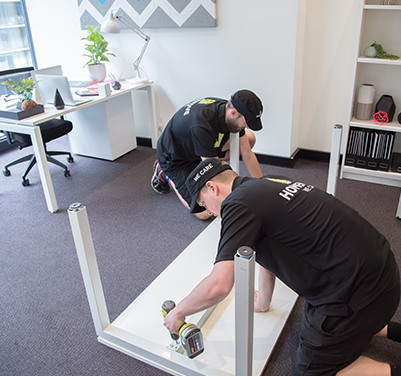 Let our Melbourne office removalists take care of packing, loading and unloading your workplace. You can relax knowing that your office removal is being handled by experts in fragile removals, so you don’t need to worry about any damage to your office space, equipment or injury to your staff. We’ll make sure your move is handled quickly and efficiently leaving you the time to focus on setting up everything else. With our help your business will be up and going again in your new premise without missing a beat. Don’t be fooled by the name, at Homemove we also specialise in office removals and business relocations. In fact, we’re experts when it comes to relocating small to medium sized Melbourne businesses. We have years of experience providing tailor-made strategies to assist with the logistics of your office move. We’re able to pack, wrap and move your office furniture, televisions, phones, computers printers and other equipment safely and with minimal fuss. Our focus is your business, so we’ll plan the move to ensure there is as little downtime as possible. We will help you get up and running at your new location seamlessly. Our green credentials mean we can even help you reduce the environmental impact of your office removal.